For display data from Custom Fields, you can use AE - Custom Fields widget. It supports popular custom field plugins like ACF and Pods. You can even use it to fetch data from your custom-coded custom field. All you need is the meta key which has been used to save data in wp post_meta table. Most basic settings for Custom Field widget are field key and type. Name: Name/Key of the custom field. Some custom field also calls it as Field Slug. 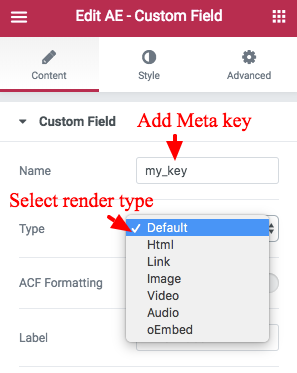 If you are using custom coded custom field then this will be the meta key of your custom field. Type: It defines how this custom field data will be displayed on frontend. Default: It refers to the default text mode. Whatever is saved in that field will be displayed as such. HTML: It is used to render data on frontend while maintaining html formatting. It is very useful in case you are adding data in custom field using WYSIWYG editor. Link: This option is when you custom field contains a URL. You can use it to display an anchor link on the frontend. It can also be used on the frontend to display link on a dynamic text (fetch from another custom field). Image: It is useful when your custom field is returning image path or image id. The best way is to configure your field to return image id. Some custom field plugins like ACF allow your to set return mode of the field. Video: Use it if your custom field has Youtube or Vimeo video URL. After selecting this option, you will get further options to customize player UI. Audio: It renders native audio player with Audio file URL entered in the custom field.